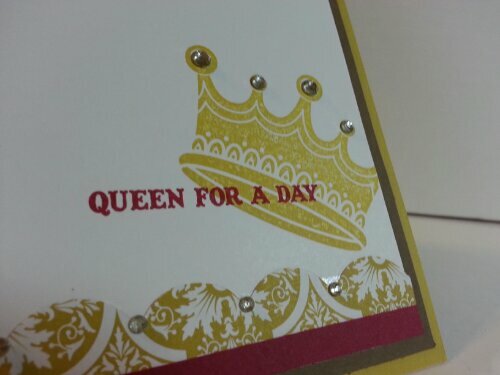 How to you give a handmade card to a stamper extraordinaire? So… that’s it. Thats what I got for mauistamper extraordinaire. Bunny, Bunny, Who’s got the bunny?? 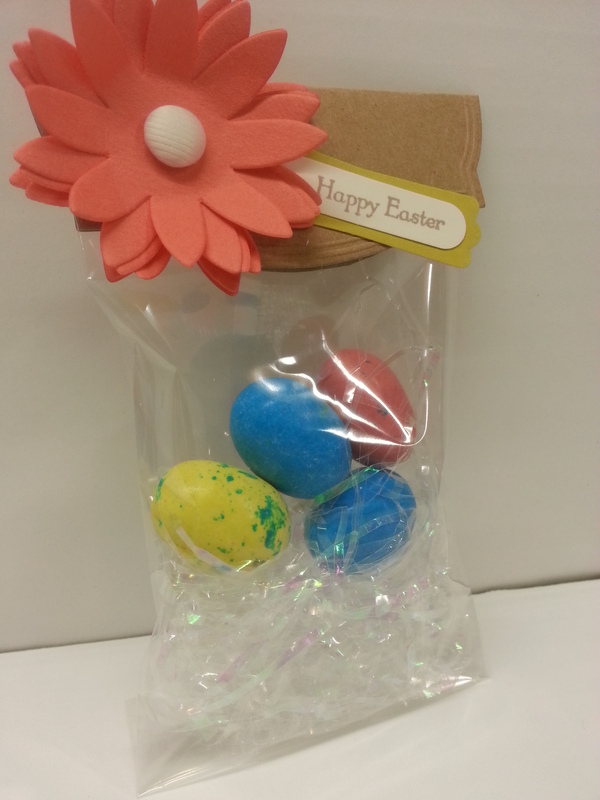 Here is a SUPER easy little Easter Goodie Bag… It uses that super easy Pop-up Posies Designer Kit. Again. Did I mention I LOVE that kit?? Welcome BACK!! 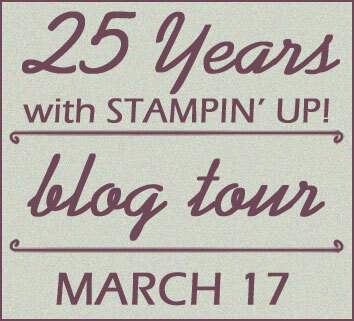 This is the Stampin’ UP’s 25th Anniversary “Best of ” Blog Tour. This month, we are featuring the ‘Best of LOVE’ stamp set. 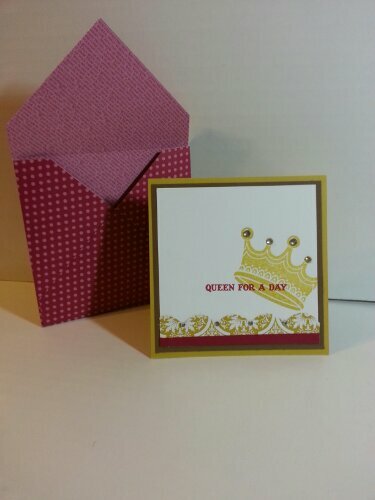 Though it is aimed at being a valentine stamp set, I think there are many other ways you can use it. It’s got perfect images for weddings and other just ‘thinking’ of you kind of cards… so… here we go!! 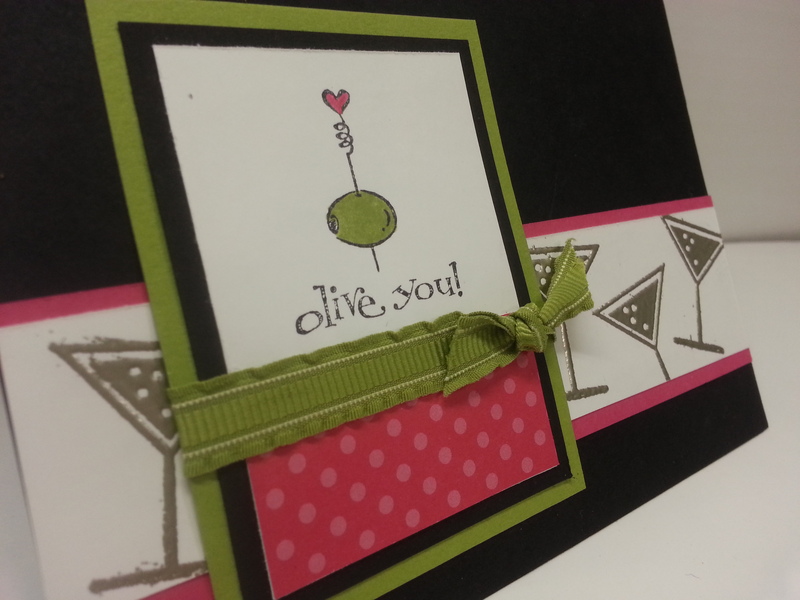 “OLIVE YOU!! Get it??? 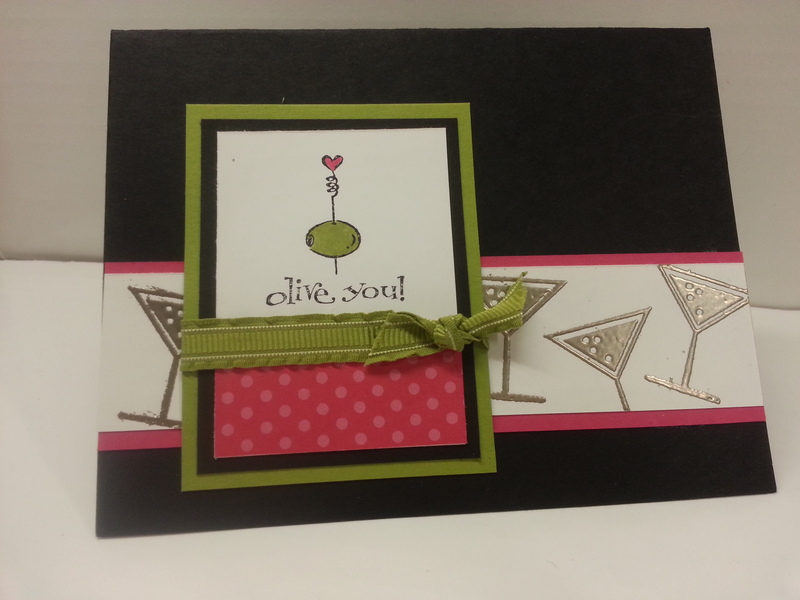 (snort, snort…) I paired this olive stamp the from the Best of Love stamp with the Martini glass from Happy Hour stamp set. I love the pewter embossing powder. It melts SO smoothly. 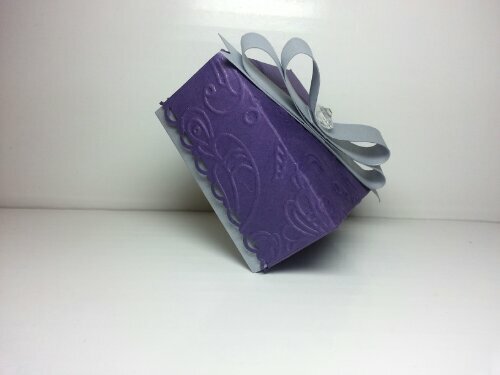 The next sample is a little more elegant… Perfect for a wedding, bridal shower… or just a heart-felt thinking of you card. 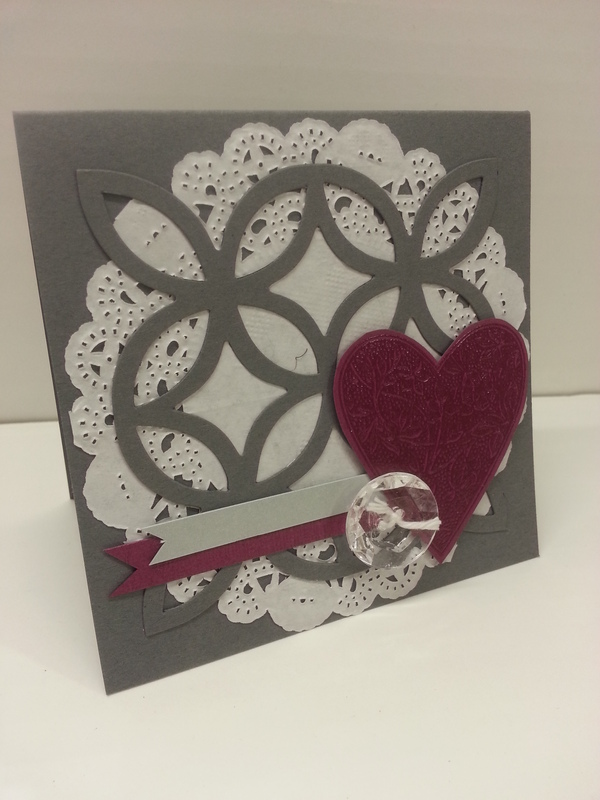 I’m using the basic gray paper and I used the paper doilies from the Spring Occasions catalog… I cut the lattice die out of gray paper too and layered over. The silver glimmer and rich razzleberry flags give a little bit of color punch over the layers. 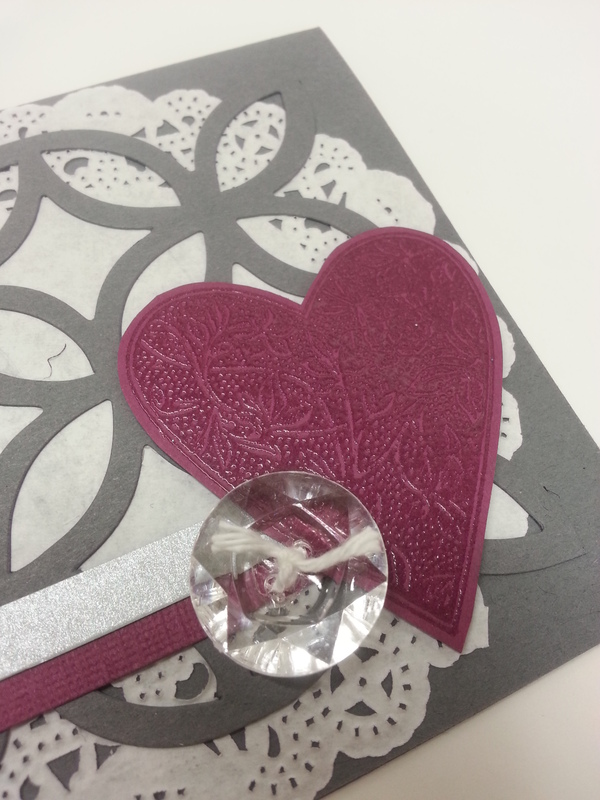 And of course, I stamped and embossed the big heart image with clear embossing powder just to give it the tone-on-tone elegant look. 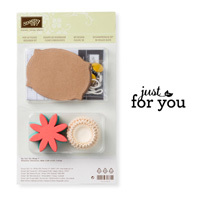 So… I finally opened the box of the ‘Pop Up Posies Designer Kit’ (item #131395, $12.95). I have no IDEA why I waited so long to play with these. 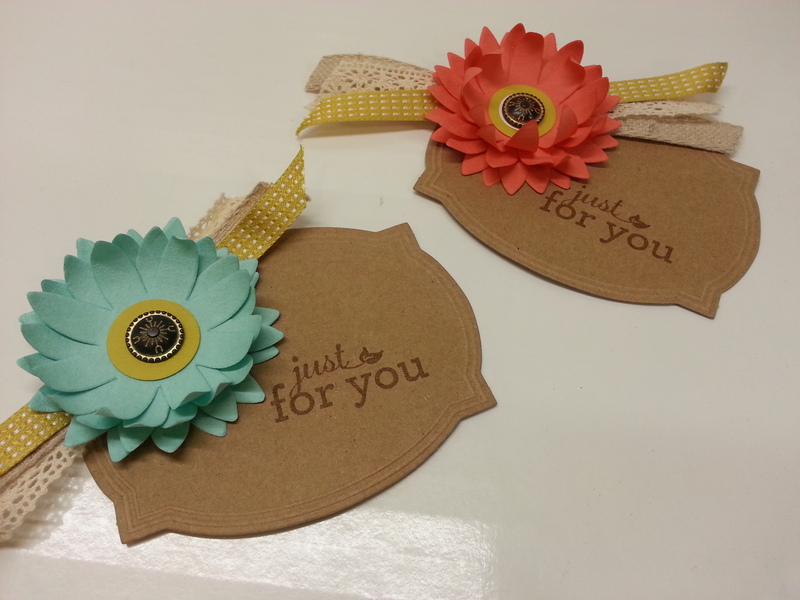 They come with pool party, calypso coral and very vanilla paper flowers and 9 brads, some twine, and the crumb cake pre-embossed, diecut tag. AND, it comes with that just for you stamp (It’s worth it just to get the stamp). For these tags, I used the antique brads instead of what came with the kit, cause my club members are making a version of this this weekend!! (sorry to spoil the surprise…) The kit says it makes 9, but you could make MANY more than that (with the paper flowers anyway)… by supplying different brads. 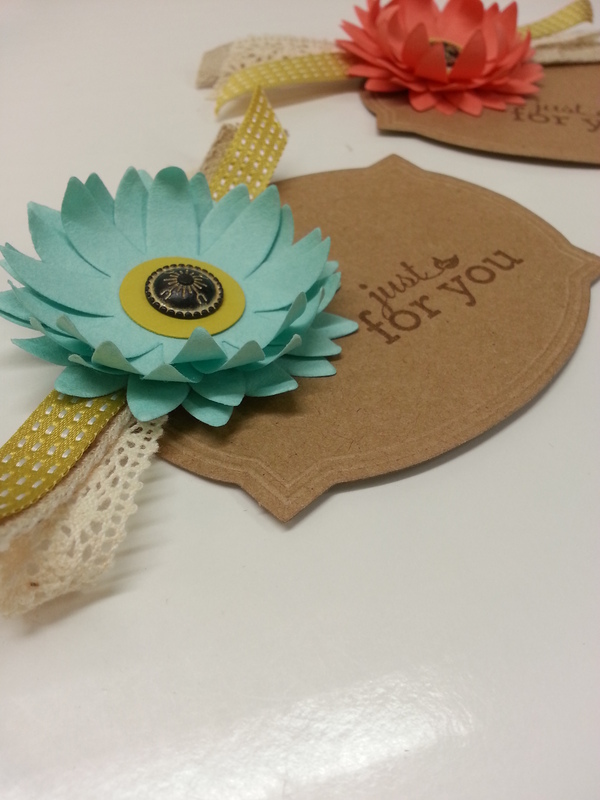 I also added the ribbon pieces to the back of the flowers, just to give it a little extra.. 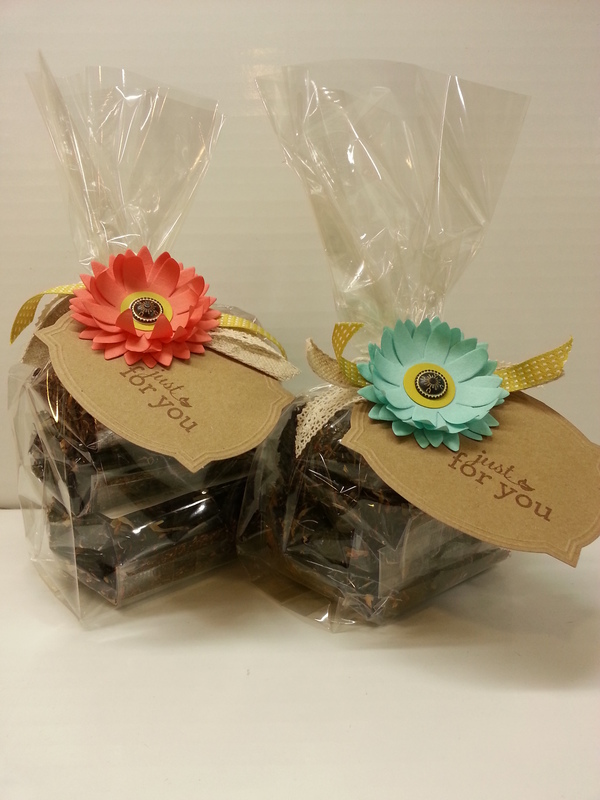 Here it is, all packaged UP!! There are so many ideas of things you can do with this kit!! I will try to get some more samples. One GOOD idea is to get the kit, and make up all the tags… just to have a stash of tags when you need to get a quick gift together. They’re so cheerful they will put a smile on ANYONE’s face. Stop back by on Sunday!! We will have our next installment of the “BEST OF…” Blog tour… Featuring the “BEST OF LOVE” stamp set!! Tis the season for weddings. 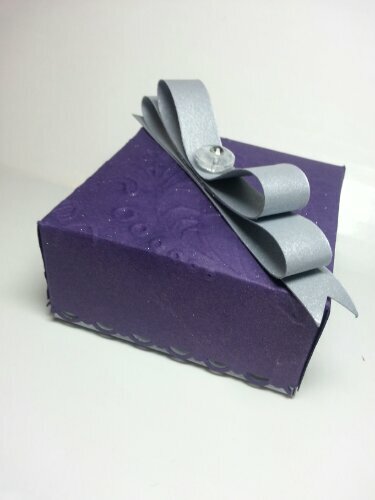 I was asked by a co-worker to design a box for a friend of hers who is coming to Maui to get married. She is gonna have mochi as her favors. A brief aside for our non-local readers. Mochi is a Japanese dessert made with mochi flour. Which is made from a sweet rice. A taste, which, no offense to my local friends, I have not been able to aquire. Just not sweet enough. I have a sweet tooth that will rival Willy Wonka’s. Anyway… That isn’t to discount the favors. The mochi used is famous on this island. And maybe… The longer I live here… I will aquire it. That has happened with many other delicacies. I made the box on the simply scored. Super easy. 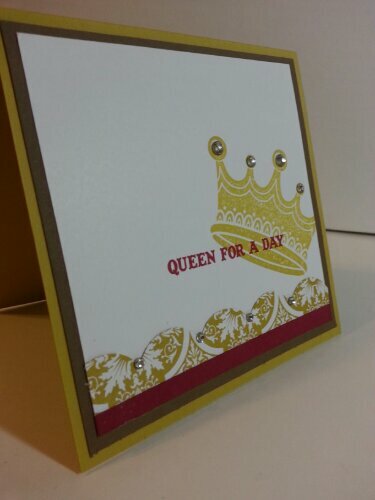 I embossed it with the elegant lines embossing folder and spritzed it with sparkle juice (the concoction made with alcohol and champagne shimmer paint). The bow is made with 3/4inch wide strips of paper glued into the paper chain loop and then gluedotted together in the center. Different lengths of paper give you the different sizes in thr bow. I covered the center with the vintage facated button and a rhinestone!! I used the scalop boarder punch do put some detailing on the top of the box so it would show up against the bottom of the box. Whatcha think? I think…. Why limit this to favors!! 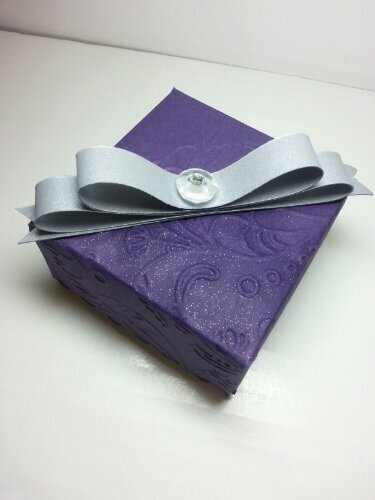 Since you can make boxes of all sizes on our simply scored… Its perfect for packages for jewelry…. Money…. Gift cards…. Bath and body hand sanatizers… Anything. I love it when one thing has many uses…. Welcome Back to the “Stamp of the Month” Blog tour. 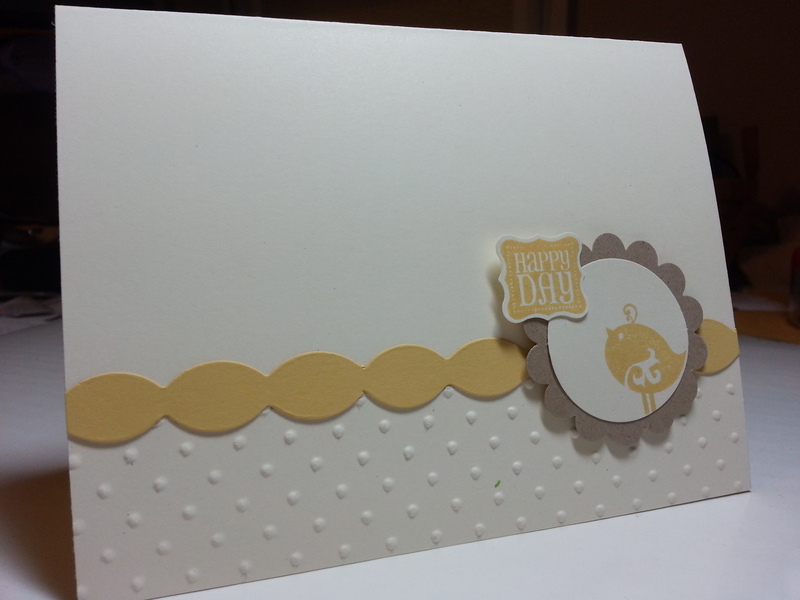 March’s installment uses Ciao, Baby from the Spring Occasions catalog. I ordered this set as soon as I saw it. Wanna know why… It fits the petite curly label punch available in SAB… and the tiny scallop circle in the Occasions catalog. And, I’m a sucker for little tags. You can use them on everything. 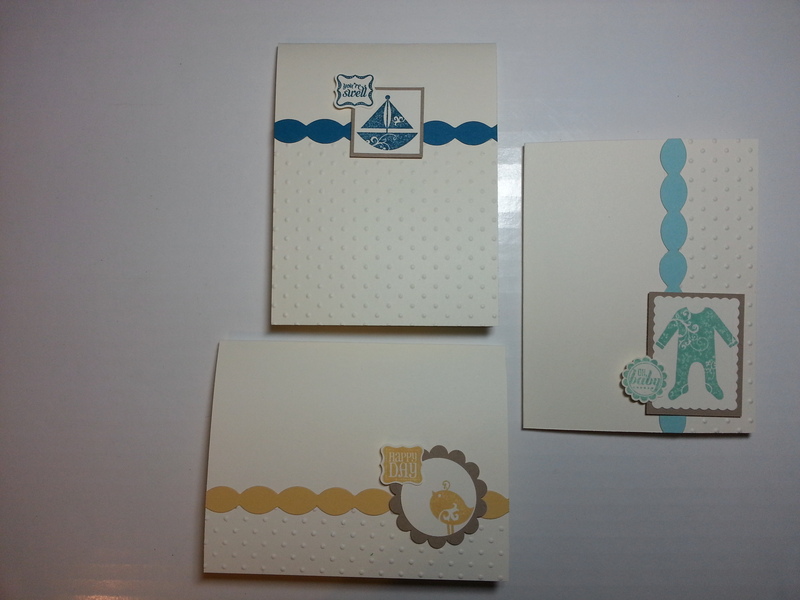 Now, this set would make gorgeous cards in it’s own right…3×3 cards, tags, etc… but, when we get to March, I know the Stampin’ Up catalog is in it’s, hum, shall we say, last few moments (don’t get alarmed, you still got a couple of months…) But, as a demonstrator, with the new catalog coming in June, I have to start looking at the stamps I have and seeing what have I used, what has gotten ‘hidden’ behind something else on the shelf… and I did… and found Baby Boutique. It kinda got stuck back behind some other stamps, and I realized this WHOLE year has passed and I’ve not really made anything with it. SO…. I’m paring Ciao, Baby with Baby Botique. Simple colors, easy lines, fun and fast to make. 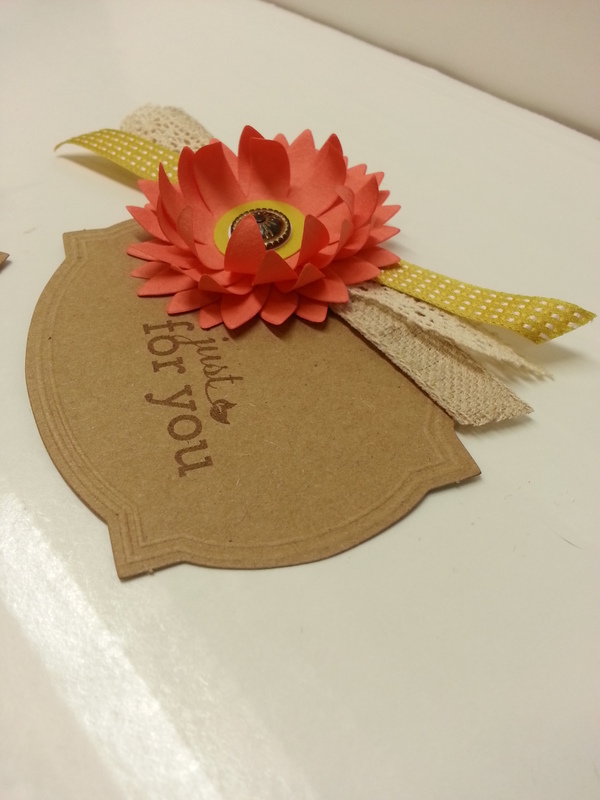 This one makes a great card for someone who you need to give a note of encouragement or thanks! 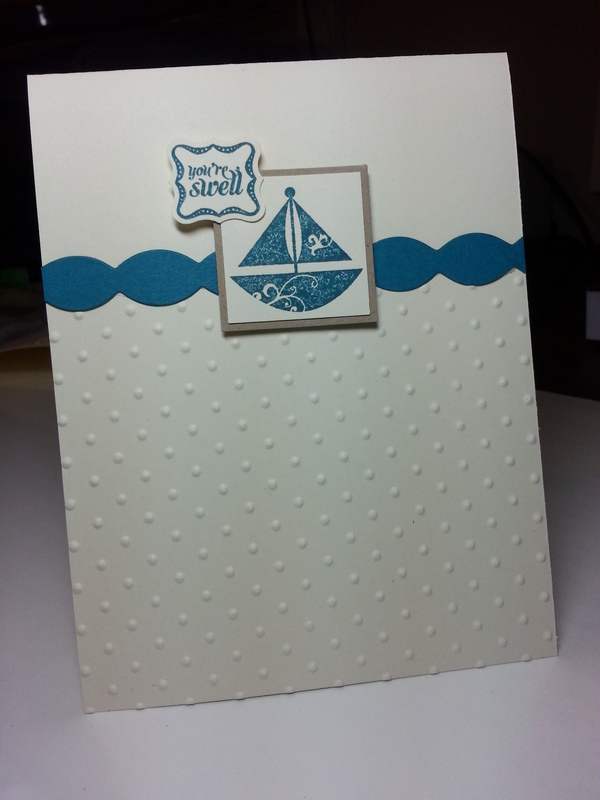 Island Indigo ink makes a very cheerful greeting.